Singapore – What comes to your mind when you think of ‘Pandan leaves‘? Pandan cake, Pandan kaya, ondeh-ondeh or a natural insect repellent often seen in the car boot. Widely used in Asian cuisine, Pandan leaf is a natural ingredient that we cannot be more familiar with. But pandan leaves-infused skin care products? That might be a first. Its properties unknown to many, Pandan leaves helps in detoxification, blood circulation, pain relief and more. Introducing Restoration Essence, an all-natural handmade skincare brand established in Singapore. Top grade natural ingredients, 15 years of research and expertise are the key success factors of Restoration Essence. Infused with lemon for brightening, the signature Pandan Leaves Scrub is gentle on skin with detoxifying and exfoliating effects. The pleasant aroma of pandan leaves also helps to relief stress and enhance relaxation. All you need to do is take a 10-cents sized portion of the Pandan Leaves Scrub and rub it on your face or hands for 15 seconds for instant brightening and moisturising effects. Anti-inflammatory, anti-aging, evens skin tone, increase blood circulation, detoxifying, softens skin and exfoliates – the list of benefits could go on and on. The Pandan Mint Salt Scrub is an all-in-one natural body scrub that you would need in your bathroom. All you need is 2 spoons of bath salt and apply if on your body or ruffled areas. Scrub for a few minutes, rinse with warm water and wipe dry. End the routine with Restoration Essence’s Avocado Moisturiser for the best results. An extended version of the Pandan Mint Salt Scrub mentioned earlier, the Pandan Chocolate Sugar Scrub doubles the pleasure with a thick chocolate scent for all the chocolate lovers out there. An essential for smooth and soft skin, this sinful-smelling chocolate scrub contains real cocoa and coconut oil which helps with skin rejuvenation. The usual drill: take 2 spoons of bath salt and apply if on your body or ruffled areas. Scrub for a few minutes, rinse with warm water and wipe dry. The Vitality Rub is your best choice to improve your memory, energy boost and increase concentration. Along with rosemary and basil essential oils, the zest of orange and pandan leaves gives you the extra mid-day boost that you needed. Apply the balm on pressure points and allow it to slowly sip into your skin. Are you at the time of the month and drowning in period cramps? The Happy Rub, as its name suggests, can bring you happiness and relief instantly. 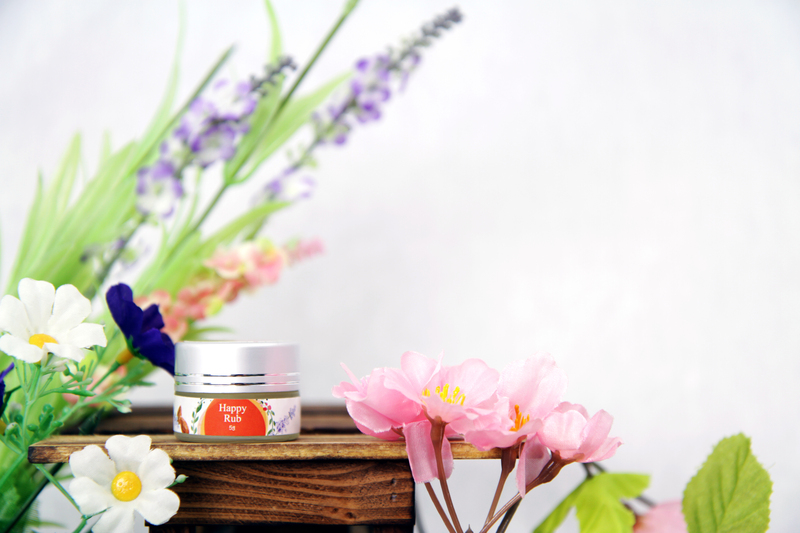 Infused with lavender and peppermint oils, the balm aids in relaxation and mood lifting. Apply the balm on your forehead, pressure points or any necessary areas and let it work its magic! The classic Ice Balm is made from top grade coconut, peppermint and pandan oils infused with honey. Also a remedy for migraines, the Ice Balm helps reduce muscle pain, lowers cholesterol levels and treats indigestion. Don’t miss the 2 new Christmas flavours (Gingerbread and Chocolate Peppermint) that are only available for a limited period of time. Where to find Restoration Essence? Tanjong Pagar Christmas Market on 25th December 2016. Jingle your way into Christmas with our next giveaway~ Here’s your chance to try out the first ever handmade Pandan leaves-infused skincare products by Restoration Essence! 5 sets of Restoration Essence 2-pc giftset (worth SGD80), each consists of a Body Scrub (Pandan Chocolate/Pandan Mint) and an Ice Balm. FILL in the giveaway form with your particulars (click here). The giveaway is open to all KAvenyou’s followers internationally. Entries will be accepted from the 3rd December 2016 to 11th December 2016, 23:59 hours SGT.Winners will be contacted via email on 12th December 2016. Winners are required to provide their full particulars (Name, Contact number and Address) for verification and delivery of prizes. This giveaway is brought to you by KAvenyou and Restoration Essence. Pandan Chocolate Sugar Scrub nourishes the skin leaving it feeling softer and smoother. It contains real cocoa and coconut oils that aids with the stimulation of the skin. It also promotes microcirculation and reduces signs of ageing as well! Pandan Leaves Scrub (With Whitening) provides a natural whitening effect whilst detoxifying and exfoliating the skin thoroughly. Pandan Mint Salt Scrub provides a natural way to soften, exfoliate, and freshen your skin. It helps to even out skin tone, increase blood circulation and act as a natural detox for your body. Not only that, it also possesses anti-carcinogenic properties and helps to reduce inflammation as well. requent use of it helps prevent signs of ageing too.